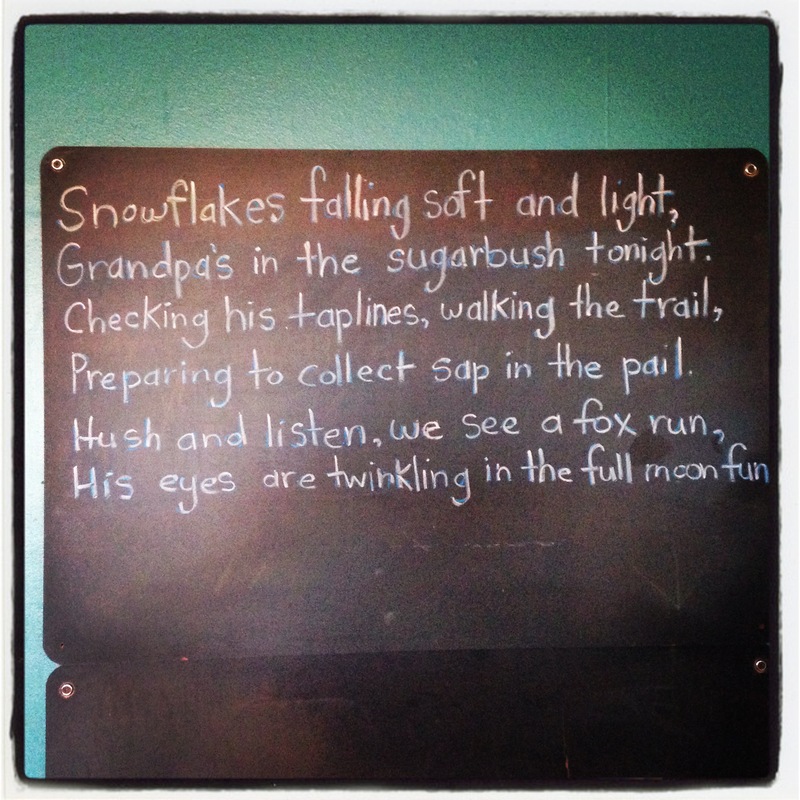 Once Upon A Time the winter snow melted, the sun came out and the mud was thick as syrup. Many years ago when families lived closer together winters were even longer. Mainly because families Did live so close together and cabin fever was terrible. The Elders of the community knew these things, so they held celebrations to break up the monotony. Everyone participated. Some made the food, some folks set up the space and others made decorations. Today in our regional community one of those celebrations is the Maple Syrup Festival. If you feel called, view a picture rich post of the 2011 Festival here. 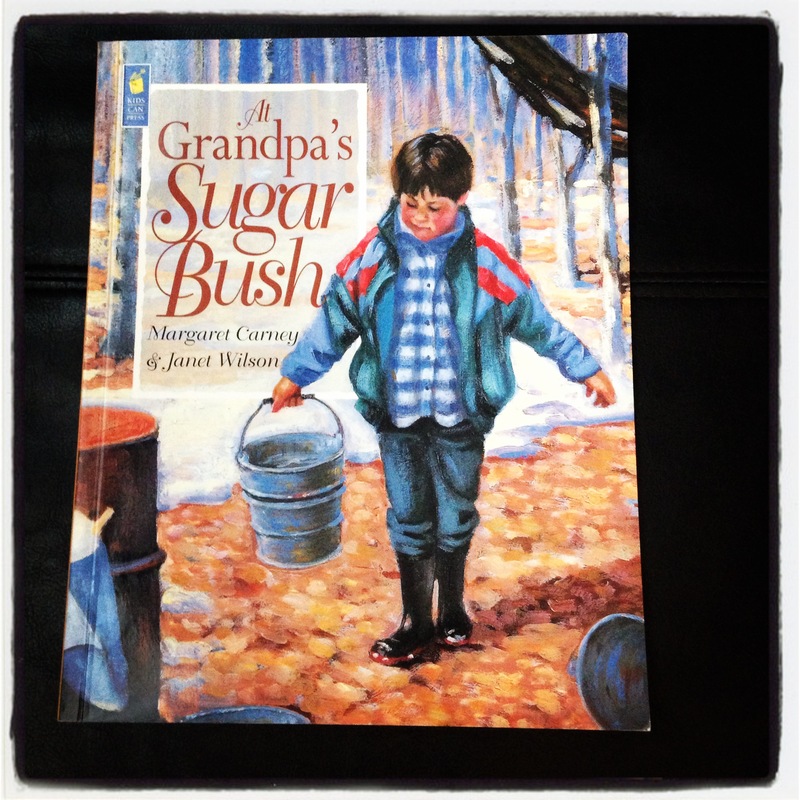 This year while reading Grandpa’s Sugarbush I decided to make up a nice verse for my children to memorize and for my older child to write as practice. 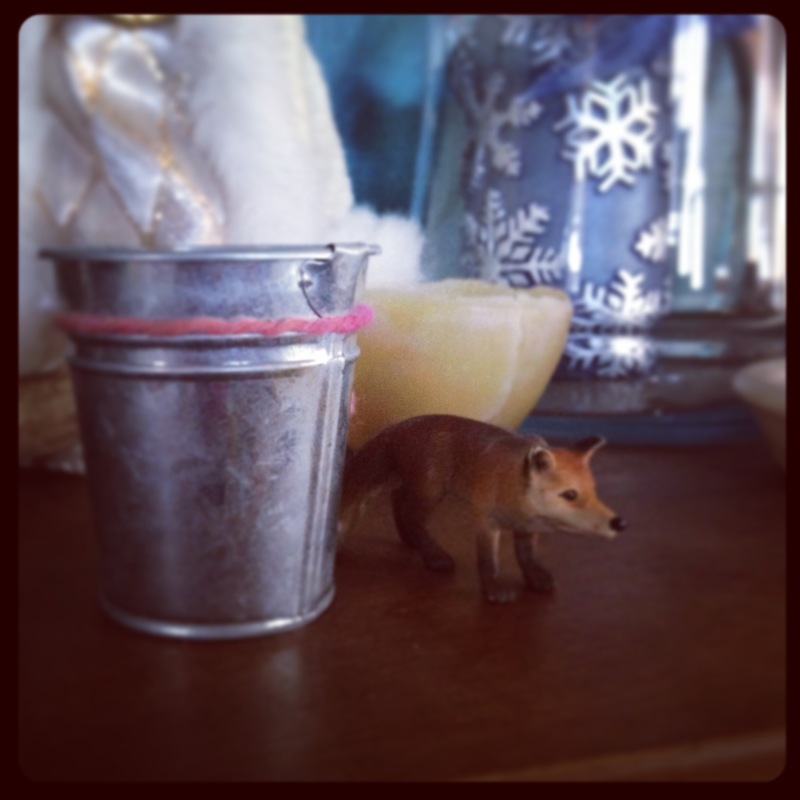 And on our seasonal nature table we are adding to our scene this week with the fox and a pail of maple syrup. If you would like more information on Kentuckiana’s local Maple Syrup Festival you can find it here. Have fun, dress warm and wear your mud boots. Kids eat free! Good morning folks. My post today is about big love, not about the holiday and consuming. I am also not trying to change anyone’s mind here. I just want to tell a story. From my understanding Saint Valentine, the man, became a Saint because he had big love for his Creator. In those days, the King told all his Knights they could not marry. Marriage is a holy sacrament to Christians. Marriage is considered an outer act of an inner decision to merge with your partner. To unionize two energies. Many people in these times also practice the marriage of their own energies, thus the inner spiritual act of marriage with oneself. The King did not want the Knights to marry, so they would be dedicated and serve him. Valentine, a priest, felt the King’s authority overshadowed God’s sacrament of marriage for all. So Valentine spent much of his time marrying these Knight’s to their loved ones in secret, till the day came where he was arrested and brought to the Tower. During Valentine’s stay until his death, he wrote many letters to loved ones signing “Your Valentine.” The period in which Valentine lived was considered dark days in humanity for good reasons. The veil of consciousness was begining to recede and draw us closer to Creator out of the watery infancy of the human race. Today things are much better energetically, but we still have a ways to go concerning Unity consciousness and equality for not just humans, but all who reside on Mother Earth. For me and my translation of this day I see a chance to raise my vibration. And also an opportunity to think about how I show love for my Creator. How do I show Big Love? How do I Love in the face of authority? There are many thoughts, but few true answers. Compassion is one and patience is another. Valentine chose to be true to his beliefs and serve. So I will serve as well by raising my vibration and Being for my children, in my own backyard. Let me not leave out that we study the ascended masters, the saints and all the religions. All with intention to evolve and learn from the past, so that my Now will be more like Heaven. Today will culminate a week spent making and giving home made items to those we love and passing along the good vibration with a hug and a smile. Nothing mass consumed. Everything with intention. And one extra symbol of love in this home to remind us of our love and union. Our Big Love. Spirit Manifest. The children. Somehow within me Spirit begs to be transformed and manifest – winter is inner growth time, like the roots in nature. SOMEHOW February, a tough time for many home educators in the spiritual mundane, the unseen is hard at work planning and dreaming. I say take to handwork! Let balance be kept. I was reminded very clearly where I am here in winter by beautiful artwork recently. 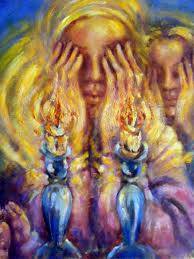 I have all these little creations within me begging to come out, begging to be discerned and transformed. Like the picture above I close my eyes, but I am not blind. Information, ideas, designs and healing stream forth through me, through my hands. Wisdom may come through me and through my limbs to my hands and into the needle through which I sew. My other handwork, so to speak, is caring for my new beautiful baby boy. Nursing and holding. Also, writing comes forth for me and I am trying to honor that creation here in my nurturing space. Especially the teachings I am to bring forth to the kids in a creative way, such as Language Arts and Math through art. Nonetheless, it is February and I am told by those who reside in the Unseen to relax the thinking mind and allow the hands to become more alive and working. We try to work with natural materials as often as possible. Wool and cotton for example. Eco arts and crafts fall naturally to the children when they are outdoors sitting on Mother Earth playing. Touching, feeling, creating, even destroying is a part of that process. Many people believe destruction is a very yang perspective, but I see it as a very feminine perspective as well. The womb, the dark waters of creation, the unseen, the powerful roiling sea within us that wrecks to make way. The balance must exist. What illusory boundaries are you destroying in your inner and outer world to make way for the new? Spring is nigh! What are you doing with your will? What are you doing with your hands? This is all part of the work. My work as a true Human Being, here at Nurturing Spirit. Thank you for letting me share. Follow me on Instagram for Visuals.